I was in a race to beat the upcoming heat wave that was just around the corner. So sure was I, that a deadline was set by moi. My fear was simple. The house would be unbearable if the temperatures peaked above 90, and that seemed inevitable as summer was fast approaching and high temperatures had already visited. It wasn’t just the inhabitants that wouldn’t be comfortable. Soon visitors would be coming, and I was not willing to let them suffer. I agreed to accompany him and internally every cell wanted to stay home and far away from Home Depot with its cement floor and air conditioners. The evening was aging, and I was getting tired. I did not want to be away from home. The goal was to drive to the store, purchase the units, and bring them back to the house. Jesus drove us to Home Depot. It took but a few minutes and the conversation allowed me forget my resistance to going. As soon as we walked into the store, it was obvious that Jesus had shopped at Home Depot many times. He seemed to know where to find things quickly. Once we found the air conditioners, it took him just a few minutes to use the information stored in his cell phone to make purchasing decisions. Luck was with us and the check out line was impressively short. We were through in less than ten minutes. Where was everyone? Were they home watching the basketball finals? Was there some big concert in town? Jesus lifted the heavy air conditioners onto the back of his truck quickly with great precision. It was a short ride back to the house and a very interesting conversation unfolded. One topic lead to another and it started with the subject of my father. “It is almost seven years since his death.” I announced, realizing that June 16th would soon be here. “Sometimes I think that they don’t really go very far after they leave this earth. No one seems to know but too many people have experienced seeing or sensing the presence of someone who has passed.” Jesus didn’t argue. I could almost hear him breathing. He was indeed listening. There was more to the story. 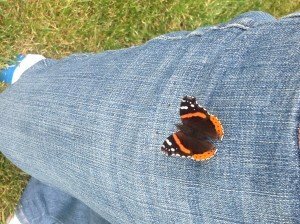 I wasn’t the only one who saw butterflies after the death of a loved one. My good friend Susan, who lives in Wisconsin, had a very similar experience. The day after her mother departed, a butterfly landed on her leg. I heard one more butterfly tale not long after my father died when I was listening to a man being interviewed on a radio show. He too talked about seeing monarch butterflies in a yard shortly after his father departed. So, if there were three of us who experience butterflies, surely there were others with butterfly stories that have not yet been told to me. Then Jesus began speaking. He was a young man in Mexico where he lived before coming to the United States. He was sitting in the kitchen eating lunch with family members when suddenly the kitchen light flickered and the telephone rang once. It wasn’t long before his family learned that his aunt had passed away, just about the same time as the lights flickered and the telephone rang. I had the feeling that he had many more stories. We had arrived and there was no more time for stories. Maybe another time.